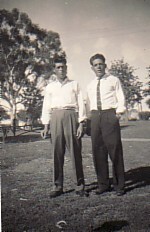 Above Middle and Right: Two photographs taken while I was in Narrabri, New South Wales; on the left, I am with my brother, Panagiotis. 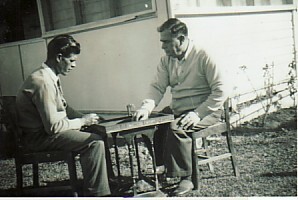 and on the right, I am playing backgammon with my first employer, Evangelos, who owned the White Rose Cafe in the town. Above: With my wife, Ioanna. 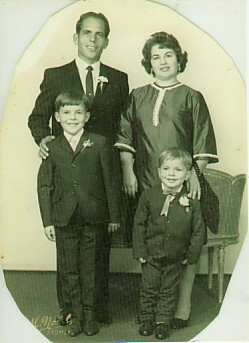 Above Right: With my wife, Ioanna, and our sons, Gavriil and Kostantinos. 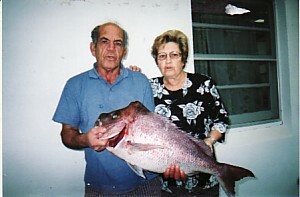 Above: With my sister, Despina, and one of my catches. 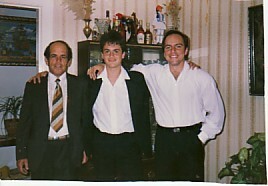 Above: With my sons, Sotirios and Gavriil. 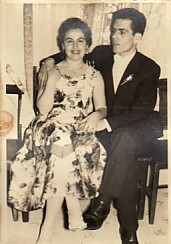 Above: With friends at a Mytilenian Brotherhood of NSW Dance. L-R: Panagiotis Spyrellis, myself, Stamatis and Maria Vlahos, my wife, ioanna and my sister, Despina, and Efstratia Spyrelli.